I’m back, y’all! Last week was moving week and I’m now (mostly) settled in my new apartment. More on that in another post. How did I celebrate moving to a new apartment? With a new cocktail, of course! 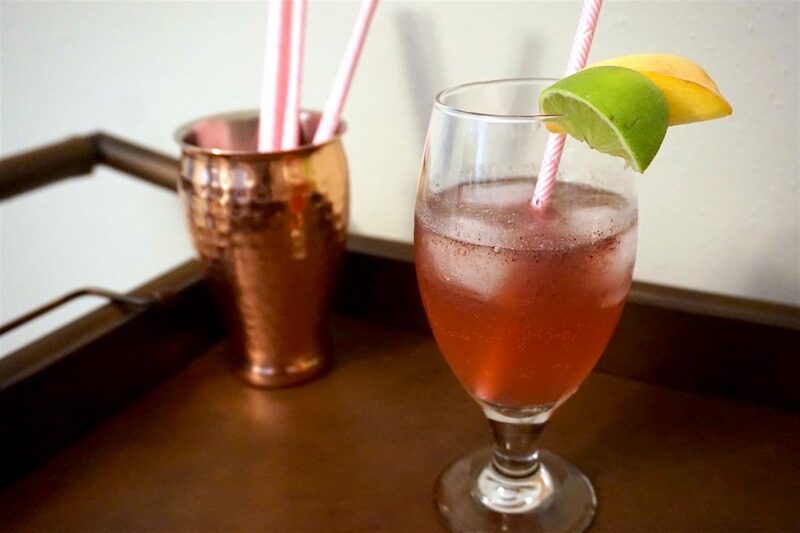 Meet The Last Taste of Summer cocktail: a fruity rum libation that’s perfect for the last days of my favorite season. I know what you’re thinking: “but Kate, you’re not usually a rum girl! Where’s the bourbon?” Don’t worry, the bourbon is close by. But I like to change things up every now and then, and I had some rum I needed to use. I have to embrace my inner just-turned-21-and-am-learning-how-to-drink girl sometimes. Oh, college. Last week when Starbucks released its pumpkin spice lattes, I thought, man that seems early… it’s not even September yet! I joked with a few friends that, on principle, I cannot and will not order or drink a PSL until we get to a month that ends in “-ber.” Well, it’s now September, but I’m still not in the mood for a PSL. Fall doesn’t officially start until September 22, after all! And let’s be real, the weather down here in Tennessee is going to feel like summer until Halloween, probably. Also, I’m so glad my new apartment has a sizable patio with a nicer view than a parking lot, like my old place. Also, please bear with my photos for the next few weeks—I’m figuring out how this new lighting situation is going to work. I created this summer cocktail on a whim a few weeks ago. I had some peaches and blackberries that needed to be used, and figured they’d make a tasty cocktail. My first attempt was pretty good, but it was missing some other flavor element. Something sweet and earthy. It wasn’t quite summery enough. This time, I added mint, and that did the trick. I’m super happy with this Last Taste of Summer cocktail. It brings together some of my favorite flavors and highlights two late-summer fruits that I absolutely love: peaches and blackberries. 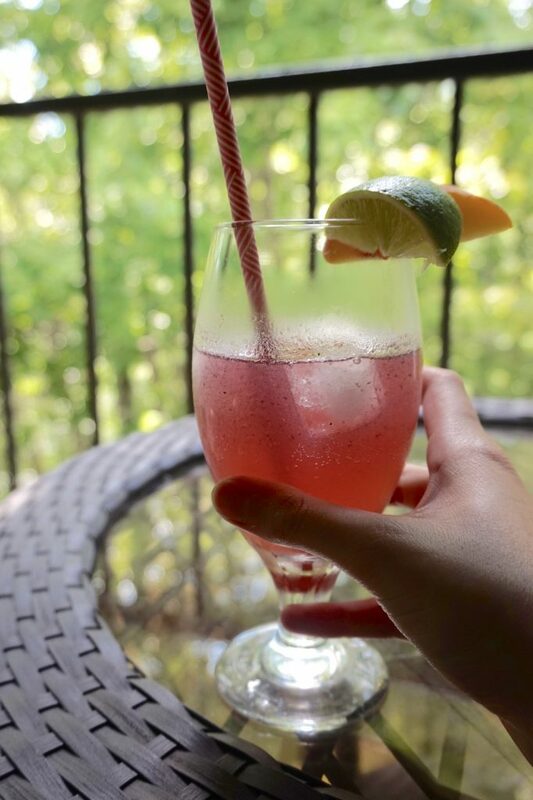 Here’s how to make my Last Taste of Summer cocktail! You can adjust the measurements based on your taste preferences, but this is what I landed on for my recipe. *I’ve been told this would be delicious with tequila. I stay way away from tequila, but if that’s your thing, give it a try and let me know how it is! Slice and dice the peach into cubes. You can peel it or leave the skin on. 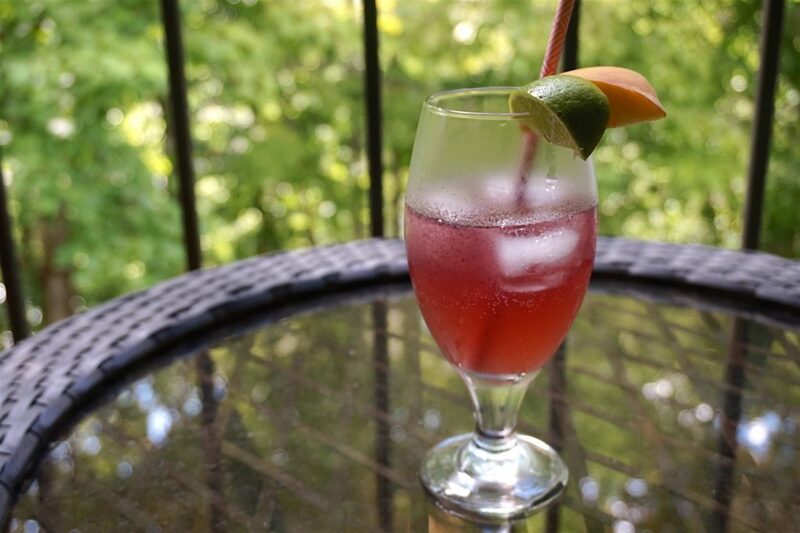 Add peach, blackberries, mint, rum and lime juice to a shaker or mason jar. Muddle briefly if you’d like, but it’s not necessary. Add a few ice cubes and shake vigorously for 30 seconds. Strain into a glass, over 2-3 larger ice cubes. Top with Sprite or club soda. Garnish with a peach slice and/or lime wedge and fresh mint. How easy is that? It took less than five minutes to throw this cocktail together. You could easily double the recipe to make enough for you and a friend. I still have plenty of peaches from my last farmer’s market haul, so I’ll be enjoying this cocktail for a bit longer myself! What’s your favorite end-of-summer cocktail? What are you sipping on this week?